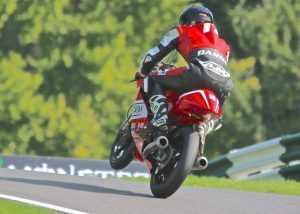 Cadwell park in Lincolnshire with dry breezy weather was an event with disappointing results. The fault was traced to the ignition amplifier and the bike was running again. Tom put in some laps on Friday and again we were having difficulty with gearing. The engine produces good power at high RPM but its short on mid range torque. We used the pristine tyres from the aborted Thruxton race and Tom put in a good effort to be 5th fastest in qualifying. Our speed seems down since the last event? The race was good for the first few laps as Tom was in 8th, dicing with Asher Durham on the other Mahindra. Then disaster struck as Tom fell off on a high-speed corner, he was lucky not to be hurt. The result of trying too hard to make up for the loss of power. The bike was repairable and ran in the Sunday warm up, it seemed OK. In the race, it was so down on power that Tom pulled in and we are sure it has a broken piston ring. On a positive note, our next race at Silverstone Round 9 (Sept 8th – 10th) we will have a new engine and other improvements made to the bike. It was good to see fellow competitor Ed Rendell finish in 3rd place after having to fit a new KTM engine on Saturday. Congratulations should also go to our last year’s rider, Tom Booth-Amos who had a wild-card entry into the Moto3 race at Silverstone’s MotoGP weekend.